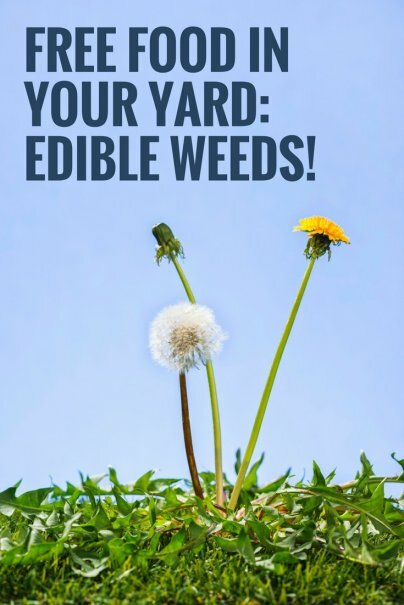 Home » Frugal Living » Food and Drink » Free Food in Your Yard: Edible Weeds! Next time you're about to yank an offending plant from your immaculate garden of perennials, think twice: you just might be looking at dinner. Oh, I know what you're thinking: damn hippies! Always eating anything and everything that grows under the sun. What's next? A guide to the best 'shrooms? Well, my friend, I may be a bit of a hippie, but that doesn't mean that you too can't partake in the pleasures of foraged food. It's one of the most frugal food choices you can make, and nowadays, it's even kind of hip (yes, that's me, putting the "hip" in "hippie"). 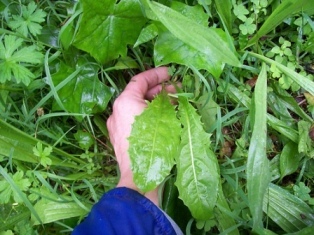 All the foodies/ecosexuals are going wild for wild weeds! I love the idea of going out in the wild to find food. Wild blueberries and blackberries grow in my area, as do morels, funny-looking mushrooms that cost upwards of $50 a pound at the supermarket. But if mountain trekking with a truffle pig sounds a bit too involved for you, consider sampling from your own yard. I've known that some of the most hated weeds are edible for a long time, but I didn't realize just how many of them grew in my boyfriend's yard. Here are a few that I've found to be quite delicious. And while I don't entirely object to chemicals as a method of weed control, I find that simply eating the invasive bastards is much more satisfying. This stuff grows like a forest in the lot next to my house, and occasionally pops up in my yard. A neighbor finally clued us in as to what it was. The plant creeps my neighbor out, because it grows fast. The shoots are up one day, and a week later, it's higher than your head. Knotweed is a crazy plant. And you really can't do much to kill it off. The root systems are huge, and can travel under foundations and across entire city blocks, all underground. The neighbor who told me the name of the weed also told us that it was edible, but that only the shoots were really worth eating. It turns out that this isn't true — I mean, I'm sure it's invasiveness is awful, but you can eat it when it gets big. I only found out because I was determined to eat those things rather than to let them live. So I just started popping the tops off of the full-grown plant. The young leaves are still curled, so I just threw away any leaves that had unfurled. Anything that was sort of waxy and light green was game as far as I was concerned — pretty much the top four inches of any of those 6 foot shoots, as well as any young leaves that were sprouting up and down the stalk. I did manage to get a few shoots that were young, growing around my rhododendron. Gathering and washing did take a bit of time, but I tell you, it was worth it. Most of the recipes that I've found for knotweed compare it to rhubarb, and thus, use it like rhubarb (pies and such). Now, I love pie, but I don't bake. So I just sauteed these tips in a little olive oil with kosher salt and cracked black pepper. And it was tasty! It'd difficult to compare the texture to anything else — sort of bamboo, sort of asparagus, sort of kale, both slightly crunchy and very tender — but the taste was lemony and delicious. A number of beneficial health effects, such as anti-cancer, antiviral, neuroprotective, anti-aging, anti-inflammatory and life-prolonging effects have been reported in non-human species (e.g. rats). Resveratrol is found in the skin of red grapes and as a constituent of red wine but, based on extrapolation from animal trials, apparently not in sufficient amounts to explain the “French paradox” that the incidence of coronary heart disease is relatively low in southern France despite high dietary intake of saturated fats. It's also very high in vitamin C! Purslane grew like crazy in my parents' yard, but oddly enough, it never occurred to me to actually eat it. My mother yanked it out of the ground with the efficiency and cold-heartedness of a seasoned gardener, and I remember thinking that is was so different from the other plants that grew in the area. That's because purslane is a succulent. A "succulent", in addition to being really fun to say, is a plant that retains water in the leaves and stems - cacti are succulents. Aloe, jade plants, hens-n-chicks - and, as it turns out, purslane. Purslane looks sort of like bloated thyme, with a reddish stem and small, thick leaves. I actually saw a bundle of purslane at Ranch 99, my local Chinese supermarket, as well as at Whole Foods, but I didn't recognize it as that plant that my mother used to heartlessly toss in the compost bin until recently. Purslane just happens to contain alpha-linolenic acid, one of the highly sought-after Omega-3 fatty acids. Why pay money for fish oil when you can grow your own Omega-3 fatty acids as part of your edible landscaping? Especially when it takes little effort to grow purslane, since it does grow like a weed. 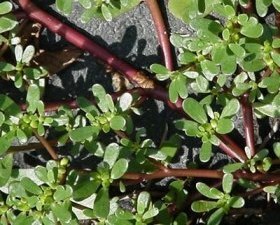 No, purslane (Portulaca olearacea) isn't yet another of those leafy "rabbit-foods" that only a Ewell Gibbons could love. Purslane is more than merely edible landscaping — it is a culinary delight! In fact, it is a succulent herb. Keep that word in mind. For "succulent" provides a hint both to the weed's identification and the potential of this edible landscaping component for cooking recipes. Not only does purslane have leaves in Omega-3 fatty acid, but it also has stems high in vitamin C. Omega-3 fatty acids are instrumental in regulating our metabolism. Purslane contains one of the highest known concentrations of Omega-3 fatty acids — five times the concentration in spinach. Purslane is supposed to add a wonderful crunch to salads and even sandwiches. Click around for recipes for purslane-yogurt-cucumber salad, Turkish purslane and lamb stew, purslane pilaf, chickpea and purslane salad, and a variety of other selections from Epicurious.com. Dandelions are the most maligned and probably the most common weed across the US. You might not find Japanese knotweed or purslane in your yard, but chances are that you've got dandelions. You can spray them with chemicals, yank them out, and scream like a maniac, but it's a never-ending battle to get rid of those things. And I figure — if you're pulling them out of the garden, why not eat 'em? Dandelions are widely eaten throughout much of Europe, where its bitter taste is balanced out by cooking it with eggs, bacon, cream, or all three. Their status as an edible green is really only starting to take root (har!) in the US now. You can find bundles of dandelion greens at Whole Foods, if you're too afraid to start with what is in your yard. Dandelion is a diuretic (it makes you pee, like asparagus), and the French have a special name for it: "pissenlits", which in addition to being fun to say, means, "wet your bed", although unless you have a weak bladder, you don't have much to worry about from dandelions in that regard. Dandelions have been used as a therapeutic herb in Europe and Asia for centuries. The root is used to stimulate the liver and cleanse the bloodstream. It's also apparently quite high in vitamin A.
Dandelion greens can be tossed into a salad of mixed greens, or sauteed and served like any other bitter green, such as escarole. Kitchen Parade has some lovely recipes for sides and soup. Edward and Eugenia Giobbi offer a recipe for dandelion greens sauteed with chestnuts. My personal favorite recipe is for dandelion greens with eggs. There are so many ways to enjoy this pervasive and invasive weed. Don't forget — it's not just the greens that are edible! Dandelion flowers can be used to make wine. And you probably know how Wise Bread feels about wine! Well, if you don't, we encourage it. Dandelion roots can also be sauteed and eaten, or made into a coffee substitute, but that sounds like too much work. There are lots and lots of edible weeds, as evidenced by some of the links above. Johnny Jump-ups, a fragrant wild violet that grows all over my parents' yard, are delicious in fresh salads. Norwegian blackberries are an invasive species in much of the Pacific Northwest, but damn, do I ever love picking those berries in the summer. As always, when foraging, don't eat anything that you can't positively identify. Don't pick anything near industrial waste sites, and be sure to wash everything very thoroughly. If you use herbicides and pesticides in your yard, you might not want to eat anything that grows there (then again, if you already do eat things from your garden, so be it). It isn't just for hippies! :) We eat weeds too, and I doubt we'd ever be labeled as hippies. (not that I'd have anything against that!) I consider it my hobby! Talk about making lemonade from lemons. Next time I mow my lawn, I'll pull those weeds and save them for a soup rather than give them to the garbage man. Sweet post. I agree with you(except for 'mow my lawn' - since my son-in-law mows it! ), totally! 'Sweet post' is so right! Your site is very informative, and well put together. I have book marked it so I can refer back to it from time to time. Thanks a bunch! Good post, Andrea. I just found it. Have been researching perennial and cold weather greens for the garden, but this is really quite interesting. I think I might have some of the Japanese weed out back. . .
Great post. I've been trying to find some good commentary on edible plants. I love smoothies and drinks. I'll try everything in them, including edible plants. I may attempt a thick, green type drink with purlsane, now that I have your "go ahead." Wow, I really enjoyed how everytime you mentioned there are lots of edible weeds you linked to a different page about edible weeds. Thanks a lot, now I have more browser windows open than weeds in my yard. Browser windows aren't very good for you either. Thanking someone for too many browser windows is sort of like thanking them for the outfit you chose to wear today. You don't have to click the links, genius, and if you know anything about how teh interwebs work, you'll know that you can right-click any link and select how you want it to open. I agree with Andrea on this one, If you don't know how to use the web and your own cmputer don't try to place the blame on others. Get a clue. I accidentally found your page, yesterday i watched a re-run of Oprah with Dr. Oz, he mentioned and showed purslane as being very healthy to eat, then i saw it and remembered that i yanked a similar weed out of my garden recently, so i spent most of today googling the web for purslane and also stumbled onto your page, thank you for your insights and humor, this has been very educational, now i'm going to make salad out of the purslane and cook the amaranth from my (weed) garden and shock my niehgbors and guest when i offer it to them! Is that photo supposed to be of a dandelion leaf? If so, it doesn't look like any dandelion leaf I've ever seen. Fortunately, there are a lot of edible dandelion look-a-likes but the dandelion leaf is rather distinctive. I prepared delicious bunch of dandelion greens for dinner last night, and my dandelion leaves don't resemble the picture at all. I'm certain the greens I picked were dandelions (they appear in the same place year in and year out). I've never been successful at pulling them out so I gave up and started eating them instead. Now I'm wondering about possible varities of dandelions and mature summer leaves vs. spring leaves as possible answers. I would love to know which of the other varieties of Dandelion look alikes you can eat. We have a large yard and all these look alikes grow in abundance. Some other weeds that look like spinach leaves are all over; and of course being weed eaters ourselves, we are salivating over the possibility that more in the yard is edible and want some more info. If you can email me, I will send you a few pictures. ...and it was definitely inspiring and enjoyable reading. We have plenty of purslane and dandelions here. I don't care for purslane myself, but my hens sure love it. It's very satisfying to have a good reason to yank weeds out, and to have a better use for them than compost. My hens take these plant "enemies" and turn them into eggs for me! I'm going to try a saute of dandelion greens soon, I swear! "Dandelion flowers can be used to make wine. And you probably know how Wise Bread feels about wine! Well, if you don't, we encourage it. " Knotweed (like rhubarb and sorrel) had oxalic acid. The sour taste is nice, but as the plant ages, the levels of oxalic acid can become unhealthy. We don't ever eat rhubarb leaf, and people who grew up with rhubarb usually don't eat it very far into summer. If anyone in your family has gout, you might want to be doubly careful. So I'd stick with the young knotweed. The older stuff makes reasonable, fast-decaying mulch that can be used to crowd out...more knotweed. If you have stands of thick knotweed shoots, they make nice fritters. I peel them, cut them in strips, soak them in a bit of lightly salted water to decrease the bitterness, and then flour them very lightly and fry them. (There's enough sticky plant juice to hold a thin film of flour in place, no egg needed). I often do dandelion flower fritters at about the same time. Those are best with egg dip, and they are a lovely texture and mild, non-bitter flavor. Good with a bit of powdered sugar, or a bit of salt and pepper, or just plain. Unlike the leaves, the diuretic effect isn't too marked (but your... mpg... may vary!). Dandelion wine is an aquired taste, and too much work for me, when the fritters are so nice. Harvest clean, wide open flowers with no stem (the wide green part at the bottom of the flower is fine, in fact, that's the part with the best texture). The absolute best everyday green (better than spinach, and plentiful) is anything in the fat hen / good king henry (chenipodium) family. image-google it; it's unmistakable stuff, and you can find relatives all over the world. You must cook it briefly, because there is some volatile compound with an unsavory smell, but that leaves in the first 2-3 minutes of cooking. Some varients are reputed to be mildly toxic, but the stuff that grows in PA, VA, MD, WV, NY, etc etc etc is stuff you can feed you family on for years, if need be. Keep pinching shoot tips (any part that's tender) and it will get bushier and bigger, so you can keep eating from it. Let it set some seed as fall nears, so you'll have some handy next year. It is introduced, but not a noxious invasive (i.e. it plays well with native plants, and does not crowd them out). Garlic mustard pesto is strong stuff, but given garlic mustard's invasive status, I always make some, or at least chop some and toss it in soups or sauces. You can try a variety of strong or soft cheeses and a variety of nuts until you get a personal favorite. I keep meaning to dig the burdock while it is in its first year, for the root, or in the second year, before flowering, for the stem-base (a bit like cardoon, which is a bit like fancy, bitter, complex artichoke). Instead, I end up yanking it out with burrs on it after the cats come home with burrs in their belly fur. That's another totally overlooked "everywhere veggie." I have done quite a lot of cooking with stinging nettles, Once picked and well washed (with gloves on!! ), most of not all the sting has gone. Gently pull off the young leaves from the top 3-4 inches of the plant. They have a taste thats a little like aspargus and spinach. So far I have made soups in the same way you would make watercress or potatoe and leek soup but can also be chopped and added to a minestroni soup at the last minuet. I often make a nettle puree by blanching the leaves in boiling water for about 30 seconds, then refresh in cold water, drain and squeeze out as much liquid as posable the blend to a smoothe puree with a little olive oil and sea salt. It works well served with grilled or roast lamb. The puree freezes very well and a spoonfull added to soups, cream sauces or risotto can add great colour, flavour, extra iron and a conversation piece to any dinner party. This site is brilliant (although I'm not sure if some of these plants grow in Australia) but I am curious as to why every 'edible weeds/plants' site leaves out clover. It has a lovely fresh and crisp taste when added to sandwiches or salads. It also grows in abundance during certain seasons, and is actually quite sweet. It also contains vitamin E.
Do you know a weed that looks like clover but is a slightly different colour. I found some whilst on a hillwalk and the person who was walking with me convinced me to try some. It tastes like apple and grows mostly in forests but I don't know the name of it, do you? Alfalfa looks a lot like clover, and is a type of legume. I've only used it as horse feed, but I imagine it is edible. It has a wonderful fragrance. I was unsuccessful for years trying to get rid of the polk weed which can grow 6 to 7 feet tall in my northwest Ohio backyard. The deer won't eat it! Last September I was surfing the web and discovered that there were Polk Salad Festivals all over the southern states. I got a recipe off one of those web sites and man I can't keep my family out of that polk salad stuff when I cook it wih eggs, bacon and onions in less then 15 minutes. I liked it so much that I put it in an egg omelette. The stuff tastes like spinach soup. I understand that the purple berries are poisonous and not edible. Yet,I hear that folks can make some pretty good wine from those berries. Is that true? Thanks. The "skin," mature shoots and berries of pokeweed contain a teratogen / mutagen and dangerous poison that can coagualte your blood, putting you into the hospital for week or killing you. This is NOT a plant to experiment with. It should be cooked in a double change of water (to leach out the poison). Only use the youngest shoots and/or peel them. Toxin levels vary by site, so this is one food plant that you should learn how to cook from someone in your area, NOT a book. See http://www.associatedcontent.com/article/196945/tradition_or_insanity_wh... or google [pokeweed danger]. There is NOTHING good to be said for the berries. They can't be made edible in any way, so far as I know. Finally, this is a very dose-dependent, subtle poison. Below the trigger level, there's very little effect. A mouthful more, and it's like having been snake-bit. I especially would not feed it to kids while experimenting--their body weight is low. Try lamb's quarters. It cooks even faster, grows in a lot of the same regions, and you can pick and eat it safely for months and months each year. Do not, NOT, NOT!!! EVER eat pokeberries! IF you are very lucky, they will just go through you like a bottleful of liver pills (and you will have a THOUROUGHLY cleaned out digestive tract - which can take days to settle down). Pokeberries are used as a vegetable dye and will give a very nice red-purple color. I don't know how they are used for dye, but I was asked to bring some pokeberries back from a trip I was making anyway (MN to AR and back) and when I brought a sackful, the ojibwa acted as if I had brought gold to a miser, so I know it's good dye. My dad grew up during the Depression in the Ozarks, and learned how to hunt and gather anything that could be made edible, 'cause lots of times that was all they had to eat. I tried to get him to teach me all he knew, but got only a little. Try cooking poke (after 2 changes of water) with a little bacon or fatback, chopped fine, and some wild onion, then serving it with cider vinegar on the side, so it can be added to taste. GOOD STUFF. Dandelions are a little bitter to me. But wild strawberries MMMM I have them all over my lawn and people consider them a weed. CRAZINESS I tell you. Great post. My brother has encouraged me to write about eating weeds, but he has all the knowledge--I'm just the victim. At his table, I've eaten Japanese Knotweed (it is a lot like rhubarb), dandelion greens (no thanks), and dandelion wine (thumbs up). My small kitchen garden has been begging me for years to make peace with Purslane, but I didn't know it until I read your post. It's not hard to remove the stuff, but it keeps coming back. This year, maybe I'll gnaw on it a bit. I have been wondering if dandelion is edible, it grows everywhere in my backyard. During one of my life experiment incarnations, I lived on my own farm and for about 7 years raised all our food organically. Since I had moved from New York City to this bucolic existence, in retrospect,I think I was more like Eva Gabor on Green Acres than mama Walton. But, I did learn to grow veggies and edible weeds. Reading your Blog reminded me of the travails and triumphs of that period, almost 40 years ago. Some of my learning actually stuck. I will follow your writing to continue to learn what's useful and dangerous to ingest. I find your information fascinating. You have to try lambs quarters. They are very abundant where there is purslane, and they are delicious. I was reading that when people had a drought during the depression, they would can these "weeds" for use during winter. Try them today. I just finished a cup of chickweed tea. I dried it and brewed it with some Thai Basil and Mint then added a packet of Stevia sweetener and Hazelnut creamer. Delicious! 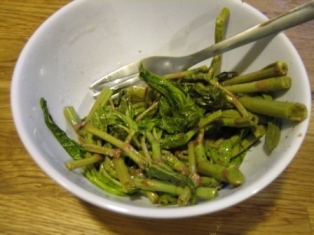 I've steamed it and eaten it raw in salad as well but I find it has a very strong texture and strong "green" taste. I am much more fond of Lambsquarters. They cook up like spinach and have a very mild flavor and are quite tender. Oh I am sure that my wife will go crazy with this post! She;s quite the green thumb and realyl love plants and flowers of all kinds. Now this is a truly interesting post. Good stuff. I do try to eat healthy, natural foods, and am working to make that the foundation of my diet. Lots of veggies, fruit, whole grains, and lean protein. I strongly believe that there is a correlation between eating well and overall quality of life - INCLUDING the financial side of things. If you keep yourself healthy, you'll be in a better position to both earn more as well as enjoy a higher quality of life. That said, being a suburbanite, I have picked fruit/veggies at orchards and farms here and there, but haven't ventured as far as wild plants! This cetainly represents and abundant food source, but it requires some alternative thinking and a paradigm shift for a lot of people. Additionally, we should probably be educated on the impact of some of these plants on our bodies - better be careful, as some could be toxic. Overall though, this represents another frontier in fresh, healthy eating that we may cross someday. Its not mainstream now, but those of you doing this may be "pioneers" in this venture, though I would say our early anscestors probably ate these things. Anyway, at the least, this is alternative way to eat healthy "greens" at minimal, if any cost. Good post. Is this website affiliated with Chick Filet? I thought they were a Christian establishment! Um, no. We are not affiliated with Chick-fil-A. With all the cross-breeding and genetic engineering that goes on these days, I'm surprised we don't have more edible weeds-- but then I realize, where's the profit? So I blame the agricultural industry for growing stuff that costs billions to grow, harvest and deliver, when everything we need could be growing right on our own front-lawns. Thank you Crony-Capitalism! Otherwise, plant-scientists could get filthy-rich by patenting "steak-grass" and other weeds that would grow everywhere, and that you could harvest with a lawn-mower. But that won't happen because Big Agriculture makes the rules and gets the subsidies. It is common to eat weeds where I am, as an example.. I know this beautiful salad of dandelion flowers, wood sorrel, viola flowers and lambsquarters with a nice lemon and olive oil dressing, simple and really really tasty and nutritious. 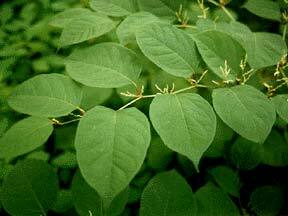 japanese knotweed in particular is such a yummy ingredient its just knowing how to cook it. I've put an easy and yet delicious ingredient list for a japanese knotweed crumble below, i definetly recommend you try it! It such a nice ingredient to work with, i think it needs to be made more aware to the public as eradicating this annoying weed just became easy!! and Jim Meuninck. I've learned a lot with it. Great tips. Does anyone know of a site that has an alphabetical list of edible weeds with a photo of each one? You know, I haven't found on yet that is particularly extensive, but I'm working on updating this post to include more weeds. I recently ordered a couple of handbooks on the topic, so hopefully that will help. Dandelion coffee is not so difficult and worth the trouble. Dig out the entire root, chop finely lengthwise and lay out the root sections on an oven tray then bake at 200 degrees C until they turn dark brown or even start to burn. Take out the darkest or burnt ones and continue until all are toasted. I never had eaten a weed until I lived with and married my ex. He grew up on a farm. So milk weed was the 1st thing we made. Cook it like spinach.. When it is young and growing never when the flower comes out...and enjoy it. Well I know that onion grass is edible. It has sort of rubbery blades, and they are cylindrical in shape they also smell like onions. Though thats probably because they are. These things people domesticated to the large onions we eat today. but don't hesitate to use them in recipes the blades and bulbs can be used. Plaintain is another weed that is highly nutritious. I'm in Idaho its all over the place. There are quite a population of plantain in my yard as well. I have eaten a bit and it is pretty good. I love Japanese Knotweed! It's packed with resveratrol, which triggers anti-aging genes. Have you tried adding wild greens to green smoothies? If you haven't heard of them, green smoothies are blended leafy greens with fruit. The taste of the fruit dominates the greens, so if made with the right ingredients, green smoothies are delicious and offer tremendous health benefits. Whether or not you consume green smoothies, the Wild Green Smoothies group is a great place to share knowledge and healthy raw recipes as well as to connect with like-minded people. THE YOUNG POLK IN YOUR BACKYARD IS EDIBLE!!!! **** I STRESS THIS ABOVE ALL.. "THE YOUNG POLK LEAVES.."